Amy: I really enjoyed the trip to Malaga; as well as enabling me to practice my Spanish I met some great people and visited amazing places. The hotel we stayed in was amazing. The rooms were really big so it didn’t feel cramped even with three of us sharing. The group was mainly in one section of the hotel and it was nice to be able to sit on the balcony and talk with each other. Liam: I loved this trip and miss it badly. I loved everyone on it including the tutors, I love Malaga and I miss the food, weather, just everything. As for the hotel, it was luxurious. I expected maybe some budget hotel with just a bed and a bathroom, but we were treated to Hotel Las Vegas which had a swimming pool, a pool table and a buffet style breakfast in the mornings. Our rooms had a TV, balconies overlooking the pool, a mini fridge, luxury bathrooms and comfortable beds for a light sleeper such as myself. I haven’t slept that good in years. Martynas: Everything was perfect including travelling to the airport, the flight, and there was a bus already waiting for us in Spain which took our group to the Las Vegas Hotel, which was really comfortable with a really nice view from the balcony. I had friendly roommates and breakfast was included while staying at the hotel. Amy: We were able to explore the city in our spare time and the places we visited on the schedule were really interesting. I enjoyed the places we visited, my favourite was Nerja. 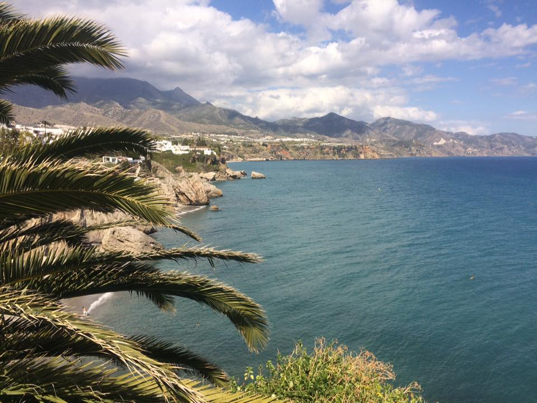 We started off by visiting Nerja itself, the restaurants and views of the coast were amazing. 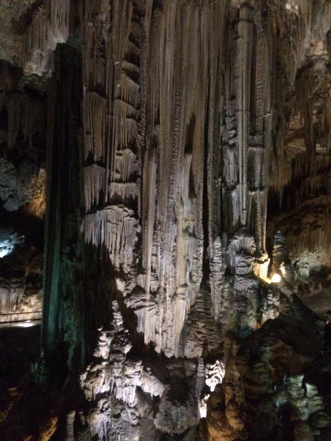 We then went to the caves which were really interesting and beautiful. Liam: The trip leaders were perfect. They adopted a laid-back style and nothing was forced. They even gave us the option to stay back at the hotel to explore Malaga ourselves, given we come back at certain times. This was very fortunate for the participants who were tired or maybe didn’t have the funds to support the trip. Both of them were very caring, kind and fun and we were very fortunate to have them on the trip. As for Malaga, the trip was perfect in terms of variety. We saw attractions (Cathedral, Picasso Museum, Gibralfaro Castle etc. ), ate various foods (Spanish tapas & paellas, as well as having the freedom to go anywhere) and we used coaches to go to nearby places such as Nerja for the caves and Granada. 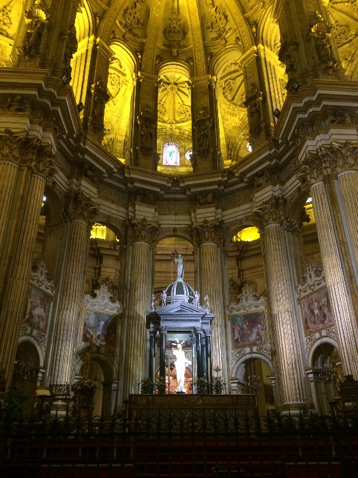 Martynas: The second day we travelled through the city centre of Malaga, visiting all the major tourist sites. The next day I really enjoyed the trip to Nerja. We saw amazing beaches, the village itself, also visited impressive caves and had an audio guide which helped us to understand how everything formed through millions of years. It is nice that we had free time as well so we could explore the city in smaller groups. The next day we visited the University of Malaga where we had the opportunity to have conversations with tutors and see the university environment. 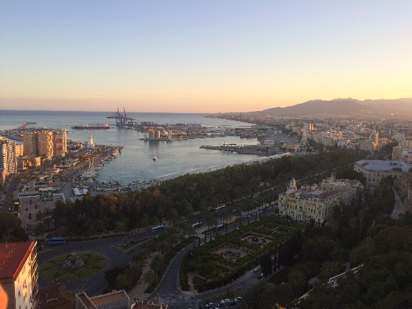 Later we visited the Picasso Museum and the Castillo de Gibralfaro Castle with fascinating views of Malaga in sunset. Amy: The food we tried was really good, the meal I had at the flamenco show was amazing. We tried our best to order in Spanish and hearing Spanish people talk helped me understand how to pronounce words. Liam: I only spent a week in Malaga but paying for food, speaking to the locals and reading the city signs builds you not only on a language scale but also as a person. I took Spanish Add+Vantage for two years, then I applied for Linguae Mundi post-beginners and fell in love with the language. I was hoping this trip would do just that. Having lived in France, I became fluent within six months just from being in the country. Martynas: I fell in love with the Spanish culture, music, atmosphere and night clubs. The food was nice as well. Amy: The week in Malaga was amazing and it has encouraged me to practice my Spanish ready for when I volunteer in Almeria in June. Liam: Malaga as a city is amazing and I will definitely go back. I feel like I have developed my Spanish to a whole new level. Martynas: I enjoyed this trip so much. Really big thanks for our leaders for everything, they were kind, friendly and simply amazing. If you’re thinking about coming to Coventry and want this experience for yourself, check out our Linguae Mundi and Centre For Global Engagement pages . YOU could be writing our next blog about your travelling experiences! Get Involved!, Global Travel, Guest Blogs, Join Us, Real stories, Student Wins, Undergrad, Why Cov Uni?